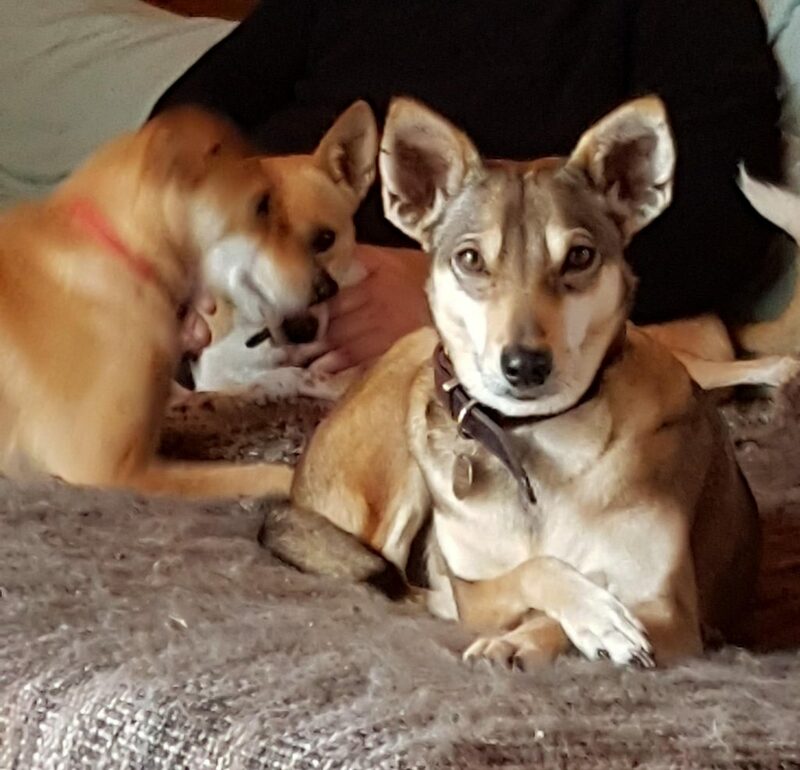 The Dog Behaviour Lady- Three Street Dogs from India. Mum and Two Pups. Three Street Dogs from India. Mum and Two Pups. Two years ago when the couple were living in India they adopted a street dog – or she adopted them. After a few days, one at a time, she carried five puppies to them. Later they returned to England, bringing Ella with them. Her puppies stayed behind. The two shyest pups still had no home by eighteen months of age, so six months ago the couple shipped them over here to join Ella. They had named them Whitey and Red simply to identify them, and these names have now stuck. From street dogs from India to house pets. They have already done exceptionally well in integrating these three street dogs from India into life over here. Having only mum Ella to start with, they transformed her into a dog who is chilled and secure. Although seldom on lead, she always stays close. They used to take her everywhere with them. When the two pups arrived things necessarily changed. Red is soft, friendly and cuddly with people. Whitey is more of a problem. She is suspicious, more scared and very independent. Unlike Red and Ella, Whitey doesn’t seek out human contact. They live in an open country area with no fences. The couple just open the door for the dogs to go and toilet. They let them out one dog at a time or they will run off together, go hunting and exploring, maybe coming back hours later. Whitey in particular. Street dogs from India have, after all, been used to coming and going much as they please. One might think mum Ella would welcome the company of her two female pups, but it doesn’t look like that to me. She has the burden of keeping the other two ‘in line’. She’s ready to step in as soon as play gets vigorous or if one becomes aroused by something. Troubled, she faces them, teeth bared and growling. When all three together go out on a walk, the non-reactive Ella may now join in the distance-increasing aggression when they see another dog. Where letting them all run freely off lead is something they have been used to, it’s not appropriate now. They could run into trouble or danger. Whitey has already nipped a couple of people. She goes round behind them like a herding dog. Someone merely finding a dog a threat can end in the police taking action according to the new dog law. The dog could be condemned to being on lead always when out and muzzled. It’s not worth the risk. Recently one of the pups went for a distant dog – joined by the other two, which resulted in them all being kicked by the male owner of the other dog. They will for now be walked individually, or Ella alone with the two pups together. Going back to her old happy walks, a dog and her humans and without the other two to worry about, will be nice for Ella. They will work on Red and Whitey’s reactivity to dogs when out by using distance and counter-conditioning. Recall starts at home. If the pups don’t come to them promptly when just outside the house, then they won’t do so when they see another dog or a rabbit when out on walks. This means preventing all further rehearsal of running off. 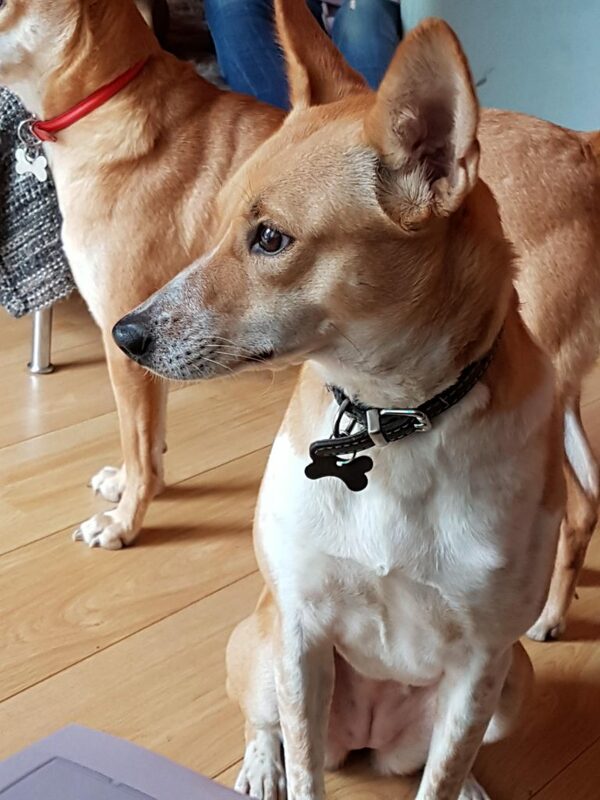 Street dogs from India will have no boundaries, but just as the couple brought Ella round with hard work, they now need to work on the two younger girls. They will make use of a long line with the two pups, both when letting them out to toilet and on walks. One pup can be on lead with the other on the long thirty foot line. They can do lots of recall work and keep swapping dogs from lead to line. As ‘Come’ (or ‘Biscuits’!) has a history of being ignored until the dog is ready, they will train them to come to the whistle, starting at home. Underpinning everything is getting the dogs’ attention. A problem with having several dogs is that they can relate to one another rather than to us. The more the dogs are ‘with their humans’ on walks rather than with their focus upon one another, the better control their owners should eventually have. The more relevant they make themselves the better. This means working on each pup as an individual – as they did originally with Ella. They will keep things as calm as possible at exciting trigger times such as before walks and reunitings. These are the times when arousal might erupt, with one over-aroused pup redirecting onto the other and poor Ella feeling she has to step in.